As the ultimate symbol of the highest form of jewellery, tiaras carry a special aura with jewellery collectors the world over. These impressive and elegant designs usually exemplify the best craftsmanship of their era. They also conjure images of fairy tale princesses and often possess an intriguing history. 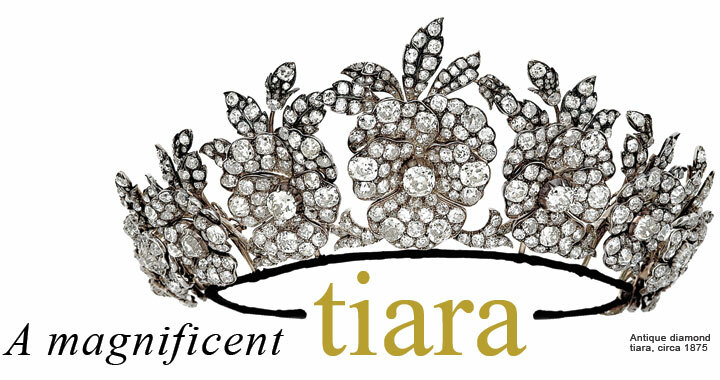 When featured in an auction, a tiara becomes the main attraction, stimulating the imagination of all jewellery lovers. Located at the time on Haymarket Street in central London, R&S Garrard & Co. produced the superb tiara pictured here circa 1875. 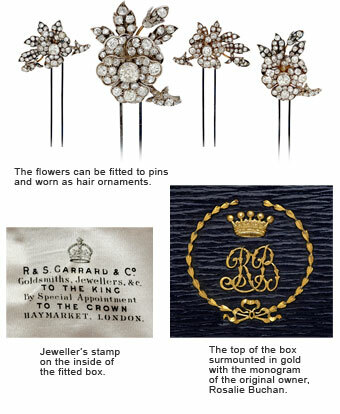 Queen Victoria appointed Garrard to the prestigious position of Crown Jewellers in 1843 and this lead to the production and upkeep of numerous pieces within the British Crown Jewels, as well as other Imperial Houses and aristocratic patrons. The 14th Earl of Buchan commissioned this floral design tiara for his wife Rosalie, the Countess of Buchan. In the 19th century, the symbolic language of flowers was an important way to communicate feelings between lovers. The pansy — from the French pensee — represented thoughts and attraction. The design is set throughout with old-mine-cut diamonds, a very early form of the modern brilliant cut. These diamonds were typically cut nearby the actual old mines, hence the designation old mine-cut, hense the designation “old-mine-cut”. They also required a great deal of manual labour as this was before the advent of improvements to diamond polishing technology. The diamonds are characterized by a small table of about half of their diameter. Additionally, the culet is large, the pavilion deep, and the outline of the girdle cushion-shaped. Since diamonds were cut in this manner during the second half of the 19th century, the stones’ irregular shape demanded great skill in the fitting of the settings so as not to leave any unattractive gaps. During this period, the diamonds were mounted in gold-backed silver — easily malleable metals — with great attention to detail on both the fronts and backs. Pieces with well-finished backs were the norm for nearly all jewellery made in the 19th century until the mid-20th century. Unfortunately, there has been a steady erosion of this fine art of jewellery making in modern times. Only top jewellery makers of very high-end pieces bother with the time, effort, and expense to create pieces in this fashion. 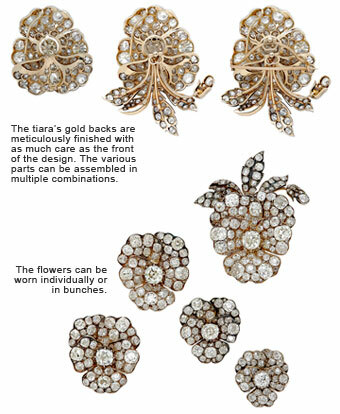 In keeping with the vast majority of tiaras of the Victorian period, the one pictured here comprises specialized fittings for its various parts to enable multiple styles of wear; in this case, they can be converted to brooches and hair ornaments. The sparkle of the old-mine-cut diamond, fine workmanship, attention to detail, and imagination all achieve the culmination of grand design. In essence, a tiara such as this one epitomizes the height of both practical versatility and romantic fantasy.